Smaller, more frequent meals keep your blood sugars levels stable – this will keep one feeling energized throughout the day. Those who have other health conditions such as gastroparesis, irritable bowel syndrome and acid reflux may feel better by eating small meals spaced three or four hours apart. Eating meals with snacks in-between are better for the digestive system, the body struggles to digest larger meals, especially if they are high in fat. A wait of six to eight hours between meals can cause problems at work, this can lead to a lack of focus, irritation (hangry), shakiness, low energy, low blood sugar levels, and eventually, over-eating. SO eating snacks between meals is an ideal situation! Some people get so consumed at work they forget to eat-use your cell as an alarm for reminders. Make time for these snacks! They will make your day a more productive day! 1. Raw Nuts are an ideal nutritious snack. They've been linked to a reduced risk of heart disease and may help prevent certain cancers, depression and other diseases. Nuts contain the perfect balance of healthy fat, protein, & fiber. They contain about 180 calories in a 1 oz serving, on average. Also, they taste great and don't require refrigeration, so they're perfect for carrying with you when away from home. 2. Roasted Chickpeas an unexpected but wholesome-appetizing snack. 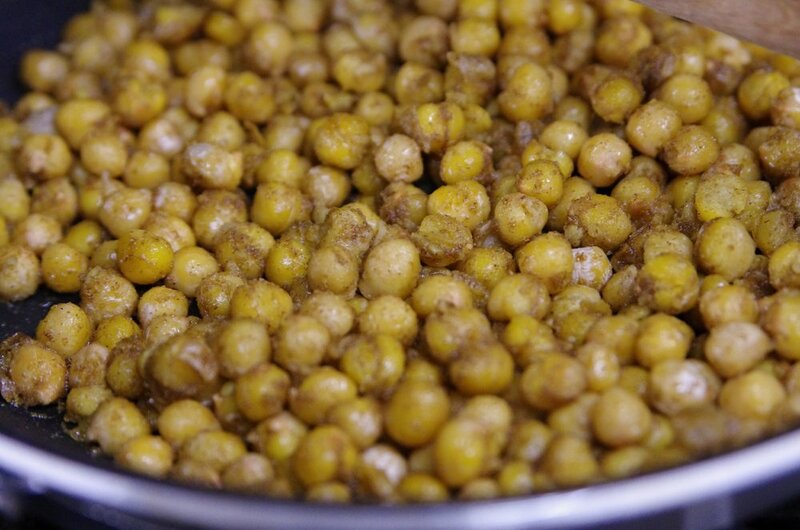 It’s as simple as roasting chickpeas in the oven and tossing them in spices or herbs. From smoky paprika to lemon and rosemary and garlic and Parmesan – they taste great! Great source of fiber as well! Roughly 1/2 cup offers 6 grams of fiber, 7 grams of protein, and 135 calories. 3. Plain Greek yogurt & berries make a delicious, nutrient snack. In addition to a great source of calcium and potassium, Greek yogurt is also high in protein. Berries are one of the best sources of antioxidants around. You'll get a good variety of antioxidants if you consume a mixture of different-colored berries. (For example:blueberries, raspberries, blackberries, strawberries). Combining 3.5 oz of plain full-fat Greek yogurt with half a cup of mixed berries provides about 10 grams of protein and less than 150 calories. 4. Apple Slices with Peanut Butter. Apples and peanut butter taste awesome together. Apples are high in fiber and polyphenol antioxidants that improve gut health. Peanut butter may have additional benefits for heart health. It has been shown to increase HDL cholesterol and reduce LDL cholesterol and triglycerides. Keep in mind, peanut butter is high in calories. A medium apple with 1 tablespoon of natural peanut butter provides a nice balance of sweet flavor with crisp and creamy textures at under 200 calories. 5. Cottage Cheese with flax seeds. Cottage cheese and flaxseeds, each have health benefits on their own. Together, they're a super-healthy snack. Cottage cheese is a high-protein food that is very filling. Flaxseeds are beneficial for weight loss and blood sugar control. 6. Cucumber Slices with Hummus. Cucumber and hummus are nutritious and go well together. Cucumbers contain cucurbitacin E, a compound that may have anti-cancer effects. Hummus is made from chickpeas, olive oil, and garlic which may improve heart health. One cup of sliced cucumbers dipped in 3.5 oz of hummus has about 180 calories. 7. Cherry Tomatoes with Mozzarella. Tomatoes and mozzarella cheese are a delicious combo and they're healthy too. Tomatoes are rich in vitamin C, potassium and lycopene, an antioxidant that may reduce your risk of cancer and heart disease. Mozzarella cheese is high in protein, calcium and vitamin B12. It may also decrease heart disease risk by raising your levels of beneficial HDL cholesterol. 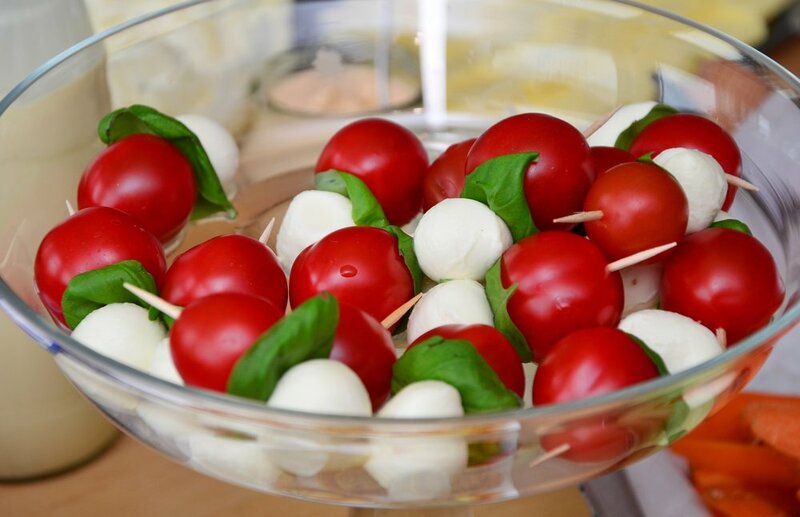 One cup of cherry tomatoes paired with 2 oz of mozzarella cheese has less than 200 calories. 8. Hard-Boiled Eggs. Eggs are one of the healthiest foods you can eat. They contain protein, vitamin K, and B12, to name a few. Eggs are very filling and may reduce the number of calories you eat for many hours, which should help you lose weight. Two large, hard-boiled eggs contain about 140 calories and 13 grams of protein. 9. Edamame. A dish of steamed soybeans. It's a great snack for vegetarians or anyone who enjoys their unique flavor and texture. Edamame is rich in the antioxidant kaempferol, which has been shown to cause weight loss and lower blood sugar in animal studies. It is also high in folate and several minerals, including iron, magnesium and manganese. One cup of edamame has around 17 grams of protein and 180 calories. 10. Air-Popped Popcorn. Air popping is one of the healthiest ways to prepare popcorn because it does not involve oil, which can add to the fat and calorie content of your snack. Air-popped popcorn contains only 31 calories per cup. A cup of popcorn also contains 1.2 grams of fiber and less than 1 gram of fat. While popcorn contains only small amounts of vitamins and minerals, such as magnesium, potassium, and vitamin A, it has high levels of antioxidants. Need help with your food choices? What to eat? When to eat? Contact us for a free mini Discovery Session, so we figure out which is the best program for you!